When we bought our woodland in mid Wales 15 years ago it was in a very neglected state . The wood was a mix of western red cedar, hemlock, ash and oak. The previous owner removed all the valuable oak but left all the tops on the ground so it was really an overgrown jungle. The first thing we did was to clear site of all the oak tops and timber off the ground, which wasn’t easy as there was bramble growth covering everything. 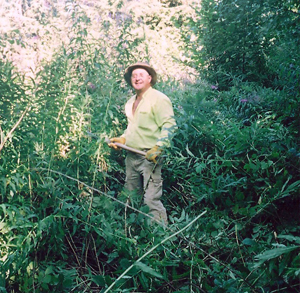 Once cleared, we felled 50% of the fir trees and re-planted the site with 3,000 native broadleaf saplings. Next ,we were attacked by Fireweed. It got everywhere, so we had to chop it down just before seeding and then covering the ground with grass seed. By tackling one section of woodland at a time, we got it under control, and where there is grass cover the weed doesn’t seem to take hold. The next decision was what were we going to do with our woodland. We had already built a couple of tracks and a flat area. We decided to apply for permission to have a new larger workshop on the cleared area and to create a school room above the workshop so we could have kids up there learning all about woodlands. Eventually we got permission for the workshop along with polytunnels, a sawmill, a drying shed and the school room. With our site, kids can see and experience the whole process of producing timber from seed to saw. It’s very hands-on: First, they plant seeds in the polytunnel, then they can plant saplings in the wood and then, from a safe distance, they can see the sawmill in action cutting up the timber, which is then stacked for drying. 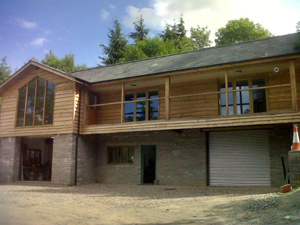 Finally, they can visit our workshop where we use that timber to make our joinery and oak frames. In the school room they can learn all about trees and how they absorb carbon dioxide and clean the air we breathe. Visiting children really learn to appreciate our trees and woodlands and pick up lots of ideas about looking after them. After the workshop building was completed, we wondered what else could we do with the woodland . 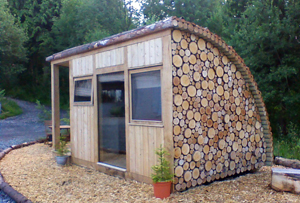 As we already had toilet/shower facilities above the workshop, we decided the wood would make a great glamping site. So, we designed a modular glamping pod by using timber and waste logs from our mill. We applied for planning permission to have 7 pods and 4 log cabins on site and it was approved. We will now have visitors in the summer months staying in our pods and in the winter months we will be running oak frame, woodland craft and woodland management courses with guests staying onsite. 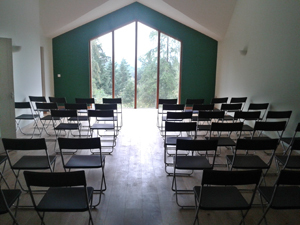 So after a lot of time, money and hard work, we now have functions/conferences, kids' visits, a productive workshop, working sawmill, glamping pods, and woodland courses - all from our 10 acre woodland; and have established a sustainable woodland-based business. Thanks for the kind comments. Hi Becci, We bought the site direct from the owner. There was an order for clear felling the site from the forestry commission but with help from coed cymru they let us fell 50% of the fir trees and leave the rest to shelter and help the new native saplings. this plan has worked better than expected with our new saplings putting on a lot more growth. In time we will fell the rest of the fir trees. as for planning it was tricky and costly but we achieved it. Fantastic, thank you for the write-up! A very quick question, did you buy from woodlands.co.uk / enter the type of covenant that exists through the site? What you have done is very close to my/our own plan, but permission is such a tricky one. A great story & I hope lots of people will come & spend time with you.